Sharing circles or talking circles are a very important element in Indigenous cultures and world views. In a circle everyone is equal and interconnected to one another. The circle is a required procedure for English First Peoples classes. I personally have found that they are a powerful tool for building trust and community in a class. It is rare in a high school class that every single individual shares their thoughts in an open setting. There are no physical barriers between the participants in the circle and everyone can see everyone else. Many students are uncomfortable with it initially but then become more relaxed as it becomes common practice. Sharing circles are most effective if used consistently throughout the semester or school year, and I use the circles once a week in my classes. They don't take long, and they can be used to build community, discuss issues or respond to texts studied in class. Note: If you would like some help implementing sharing circles into your classroom, it is recommended that you invite a member of your district's Aboriginal Education team to facilitate the first circle. 1. Once the circle has begun no one should leave or enter the circle. (Appropriate signage should be posted so that late students wait to re-join the class as soon as the sharing circle is complete). 2. 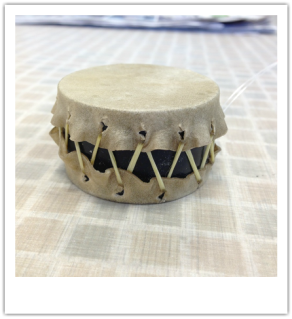 The person holding the designated sharing circle "object" (for our class it is the mini-drum) is the only person speaking. All other members listen respectfully and there is no "cross-talk" in response. 3. What is shared in the circle is safe within that circle. No one has to worry about anything being repeated outside of the circle. 4. Any member of the circle has the right to "pass" if they are not able to contribute on that particular day. 5. Appropriate language and expression are used. 6. Members should begin by introducing themselves and providing some information about their family or background. 7. The leader of the circle will acknowledge the traditional territory that the circle is being held on (The Syilx (Okanagan) Nation's territory in our case).